Can you imagine how many millions of dollars have been spent by the public utilities to provide infrastructure to this and the hundreds (thousands?) of other failed developments just in Ca.? Comcast, AT&T, Surewest, and Frontier all have to lay infrastructure before the streets can be paved. Oy vey. My mind boggles. Who do you think will end up paying for that portion of the mess? Uh huh, me too. It looks just like 1980, 1992 and now 2007. It took three extra years to bust this bubble, so it will probably take three extra years to recover. Look for a bottom in 2011 and appreciation resuming in 2015. Seriously. Think how long it is going to take to straighten out a mess like Nonterey Village. Liens, foreclosures, court battles will take 2 years. Then some vulture investor has to take the risk, then sell into surpluss inventory at cutthroat prices while building out the project. There is 3 more years. 2007 + 5 = 2012. The bank is the answer. I have not reviewed this project but in most developments the developer pays for the trench work although the service companies may lay their own cables. The funds for the underground work generally comes from a loan the developer has. If the project has a public assesment district then the costs are placed on the property in the same manner as property tax. The property in the district is generally only the subdivision area. The property owners or future owners will pay the improvement costs. The burden does not fall to the general public or the utility company. The money is lost by those who should have been aware of the risks. I am interested in your prediction of not until 2015 will Sacto housing begin to appreciate. What do you use as an estimate or predicter of the down cycle? Wow, I was on the verge of going into contract for a home in this community. I am so glad I strayed away from this and any other home in Elk Grove, as it seems to be one of the hardest hit markets in Sac. Dunmore truly is despicable for this and I hope their future sales are affected as well. I know plenty of builders who are hurting, but still moving on very slowly, but surely. This is just a very chicken move and all about his concerns for his own dollars versus those who actually bought homes/townhomes in his community. If anybody has gone to Monterey village, the "pool" and "cabana" area is absolutely despicable. I put those in quotes only because they are very poor names for what actually is there. I was told there would be a HUGE cabana and an olympic size pool by the sales rep. Wow, is all I can say. Thanks for the research and information! I was very interested in Morrison homes in Fiddyment Farm (West Roseville) for the 3 car garage in a 1 story. Same song and dance. There were supposed to be parks and commercial areas eventually. But very few houses are actually built and few of those are occupied. Not just morrison, but the other 4 builders as well. If they feel pain, are the builders going to finish parks and "small town like" main street commercial areas? I think not. We're still banking 2K a month while waiting though. It is scary how quickly Elk Grove is falling apart. I drove around couple weekends ago, looking at some homes in this area. Some of the neighborhoods looked like abandoned neighborhoods with brown lawns and trashes out on driveways and street sides strewn about. It is also scary how quickly prices are dropping. I saw one newer house on MLS that was not a fixer with 3 car garage at $125 per/sq foot in Elk Grove with other houses near that range too. That is 2001 Pricing !!!! Dr. Doom, I am using 1990-1997 as a guide. Peak, 1990. Floor 1994. Wide bottom to 1997. Appreciation resumed in 1999. So 190 years from 2005 = 2015. Wooowee. Man, I really feel for the contractors. I hope they get paid. That's a very labor intensive job & unlike most jobs you don't have the option of calling in "sick" as you don't get paid. No work, no pay. My dad many of times had to go out in the four seasons to work regardles of his health. Also if your worth any salt as a "boss" you have to pay others first before you even get paid. For Mr. Dunmores sake I hope he did. The chances of that? As you all know by now, Dunmore was bought out this week. I'll keep an eye on this development and post any progress (or lack thereof) that I see. Is the new buyer catching a falling knife? It is more likely the buyer is catching a falling anvil. Splat! Yes, the new buyer is definitely falling on a knife. Dunmore is useless. He's only looking out for #1 and he's showing he has no care for the people who have bought homes from him. And this investor, although he thinks he may ride it carefully with this "50 year old brand," is quite possibly making one of the biggest mistakes possible. Hopefully things turn up for him, but I would not want that name as I doubt anybody will be wanting to buy or trust Dunmore. It's sad to see in the TV news report that current owners in the Monterey Village are the ones touring and trying to sell potential buyers about the community and the homes. "The good news here is that once the majority of new home builders go out of business or stop building....then the resale market can recover. I agree it was the greedy builders that withheld inventory and created falsely inflated prices with each meager release. This caused homebuyers to panic in the fear that they would be priced out of the market and never own a home in California, unless they took out a risky loan...and that would was OK because according to all the Real Estate advice out there...home prices only go up never down. and 8-10 years from the bottom.....there will be another boom and this cycle will happen all over again with another bunch of suckers taking the bait...remember TIMING IS EVERYTHING." Ghettomas and some of the cheaper areas in The Grove (like Monterey Village) with all the ticky tacky junk thrown up by Sid and his cronies will tank first and might not come back. They will be extensions of Del Paso Heights and South Sac in 15 - 20 years. The paint is already fading on some of the junk rentals out in East Franklin like in Cresleigh Manors AKA South Sac South. South Sac's logo by the way should be a cross of arms featuring a knife and 9mm! Don't feel too bad for Sid, to many of the people in this business wasted money. 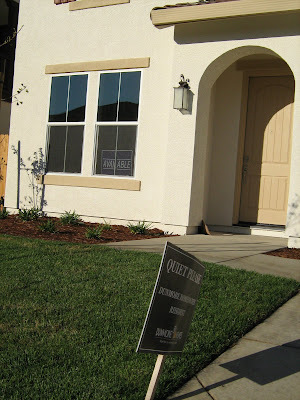 About a year ago I was in Sid's new almost finished home in Granite Bay, Its only two bedrooms but over 12,000sf. He told me that he had spent over $14M on the house. I asked him why he would ever spend so much on building a house and that he would surely loose money on it. He said, "Hey, I spent $40M on my Jet, what's $14M for a house?" Elk Grove WAS a nice city until all those blood sucking developers, idiot investors, Real Whore Home Sales Con slutants and ghetto types with their Granny Wagons up on 20 inch rims moved in with their Liar Loans and screwed up the city. Look at Franklin High. Some of the kids look like they are macking it out like back in Oakland and Richmond. There are still some good neighborhoods in Elk Grove, but Dunmore and the others plowed under good ag land and threw up 10 year houses (fall apart after the warranties run out). The homeowners were screwed royally by "Jet plane Sid"
Houses in that part of Pot Grove have been dropping like a rock. McMansions on postage stamp size lots that sold in 2005 for $200+ a square foot are now going for $140 - $150 a square foot. I have not reviewed this project but in most developments the developer pays for the trench work although the service companies may lay their own cables. In my experience you are correct, the developer opens and pays for the trenching but the utilities pay for their equipment. My understanding is that after paying for the placing of their equipment (both capital and expense), the utilities begin paying ad valorem taxes the day they sign up the first customer and put that equipment into service. And, in this case, they have 25 customers to split amongst themselves instead of hundreds. Don't you think that ratepayers/investors will end up footing the bill on this? I don't mean in the case of this one unfortunate subdivision but multiplied by all these failures across the state? Seriously, I work for a utility company. We're currently removing software from these places as fast as we can and putting it to work in areas that are doing better. But you can't rip fiber and access point boxes out and those things cost $50k and up each. That's without costing in the labor to place and the infrastructure up and downstream that goes with each access point box. Smaller utilities like Surewest and Frontier will be harder hit than the giants but I really do believe that we'll all pay for it in the end while these lots lay dormant and the utilities pay taxes for the equipment lying in the ground unused. What if Sid pays a straw man to buy his company, Sid takes the loss goes back two years to re-state his income and relizes a seven digit refund. What if the straw man is getting paid to settle with the banks, tell the sub's they are not getting paid he basically cleans up the mess and goes away. When the market comes back Sid will come back on the scene in a cape and blue tights to tell us that he had no idea the straw man was going to run the commpany into the ground and he is back to save the family name. Investors will swoop in and turn their "luxury" community into a rental slum. That area already has group halfway homes (druggies, parolees, teen criminals) popping up like weeds. Green lawns could turn brown. Cars with flat tires might fill the cul de sacs. Most of the builders are jacked the price up from $10,000 to 20,000 every 2 week if someone laid down the names. Imagine the price per year will be closed to $200,000. Builders already had received a lot of money profit scince bubble housing copllaped. Builders should pay for the city. Does Dunmore Homes have someone handling any warranty issues from homes built in 2004? If so, what is their telephone number? Since Dumore is now bankrupt, you're probably out of luck. Try contacting the court or the attorney handling the bankruptcy. Almost all builders supply warranties through other companies (in order to manage their risk) and that is probably still intact despite any bankruptcy (ex: 2-10 warranty). If not, their insurance would likely cover you.